San Jose Del Cabo, Los Cabos, Baja California Sur, Mexico. The following update about Costa Azul Beach or Playa Costa Azul is an excerpt from Los Cabos Magazine Issue 44, Summer 2016. Why: Capital of the summer surf scene, Costa Azul is the mecca for those seeking beers, burgers, and tasty waves. Zipper’s Restaurant is the seaside hangout supreme, while the offshore Zippers is an expert-level, right-hand reef break. Two other breaks, the beginner-friendly Middle and the more difficult La Roca also draw local and visiting surfers. 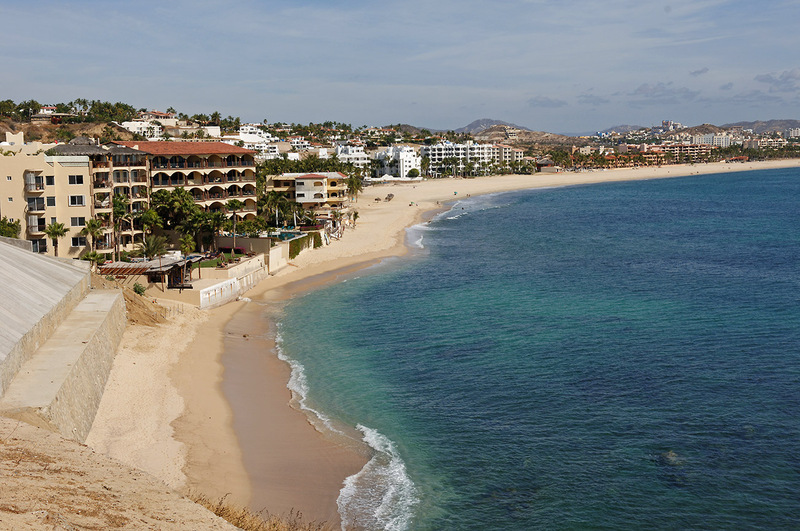 Sun and sand are also in great supply, and this is one of the best walking beaches in Los Cabos. When: The best time to visit Costa Azul is in June, when the World Surf League hosts its annual Los Cabos Open of Surf at Zippers. This year’s event, for women and juniors, was held June 7–12. Where: Playa Costa Azul is on the southwestern edge of San José del Cabo, between kms 28 and 29 on the Transpeninsular Highway. Excerpt from Los Cabos Magazine Issue 44, Summer 2016. For great summer surfing head for Playa Costa Azul (Blue Coast Beach). The surf break north of the arroyo is known as Zippers and is for the more advanced surfer. Two breaks exist to the south – The Rock, and Old Man’s. The Rock is best for intermediate surfers and the second (a.k.a. Acapulquito beach) for beginners or long boarders. In the winter, when the surf is calmer, one can enjoy swimming and snorkeling here. Walking, surf fishing and horse riding are good year-round. Horse stables exist back up the Costa Azul arroyo past the bridge as well as an overhead pulley Canopy Adventure tour that spans the canyons. Beginning at the Lookout just past the Cabo Surf Hotel at Kilometer 28, this beach runs for a mile east to the arroyo next to the former La Brisa trailer park and restaurant now being torn down for more luxury condos Adjacent to the arroyo on the east side of the former trailer park is a new beach club under construction for the Club Campestre housing development across the highway.